Marc Sokolik has done it again. 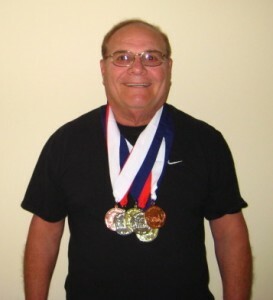 In his latest St. Louis, Memorial Day, Senior Olympics competition, with 1800 competitors, he placed sixth or better in all 11 events he entered: four golds, two bronzes, one fourth, two fifths, two sixths. I love the different events he competes in. I mean this guy is 71 years old. I bet he could beat many people half his age! You can read about him and his earlier achievements by typing his name in the search box above right. Marc Sokolik continues to amaze us all. 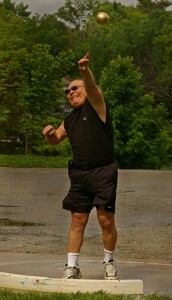 He is 70 and a terrific life-long athlete. 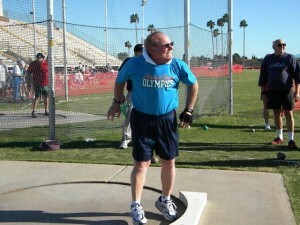 You can read about him in earlier stories , as he continues to compete in various Senior Olympics. Here are his latest results from St. Louis. YOU WON’T BELIEVE THIS ONE, BUT I ENTERED 9 EVENTS AND MEDALED IN 6 OF THEM. I AM ATTACHING A SHOT PUT AND MEDAL PICTURE ALONG WITH THE EVENT LIST. When I asked him how many people compete in each event, which is sub-divided by age groups, he wrote me that “EVERY EVENT IS DIFFERENT. ON AVERAGE THERE ARE ALWAYS 10-12 COMPETITORS, BUT AS THE AGE ADVANCES THE NUMBER DIMINISHES. 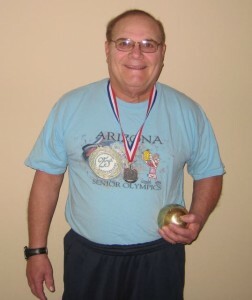 THAT IS WHY I JOKE ABOUT WINNING (MORE GOLDS) AT 80.” He also said that this was the first year he has competed in the bench press, and he won a gold in that event. Watta Guy!!! I MADE IT THROUGH A MISERABLE DAY IN FORMERLY SUNNY ARIZONA. IT RAINED OFF AND ON ALL MORNING SUNDAY, FEBRUARY 20TH. WE SHOWED UP AT 9 AM, WARMED UP AND THEN DID NOT GET TO THROW UNTIL 11:30. RINK WAS WET, MUSCLES COLD AND STIFF, SO I JUST STOOD AT THE FOUL BAR AND THREW WITH NO THREE STEP GLIDE, BECAUSE I WAS AFRAID OF PULLING MY CALF MUSCLE. I HAD ALREADY THROWN 33-34′ IN PRACTICE. WITHOUT THE APPROACH, I ONLY THREW 30′ WHEREAS THE WINNER THREW 32′. YET I WAS LUCKY ENOUGH TO GET A SILVER MEDAL. THIS WAS THE NEW GROUP OF 70-74, SO I THREW AGAINST THE 13 GUYS IN THAT AGE GROUP. I TURNED 70 DEC 15, 2010. THE BIG GUY WHO WON IS 70 ALSO. WHAT WAS DISAPPOINTING IS THAT I COULD HAVE OUT THROWN HIM AND GOTTEN MY FIRST GOLD MEDAL, BUT THE DELAY CAUSED MY MUSCLES TO TIGHTEN UP, AND I HAD A CRAMP IN MY LEFT CALF, SO I LET UP AND THOUGHT COMPETING WAS MORE IMPORTANT THAN WINNING. SO BE IT. AS YOU CAN SEE, THE THIRD PLACE FINISHER DID NOT GET TO THE AWARD CEREMONY, HE GOT HURT ON HIS THIRD THROW WHEN HE SLIPPED AND PULLED A MUSCLE AND DID NOT SHOW UP TO GET A MEDAL. TWELVE OTHER IDIOTS HUNG AROUND TO COMPETE, BECAUSE IT WAS AT GLENDALE COMMUNITY COLLEGE SOMEWHERE IN THE MIDDLE OF PHOENIX. “I STARTED THROWING THE SHOT PUT AT NAUTILUS JR HIGH (MIAMI BEACH, FLORIDA), BUT IN HIGH SCHOOL AT 5’6″ AND 160 LBS, I WAS TOLD I WAS TOO SMALL TO THROW THE SHOT. 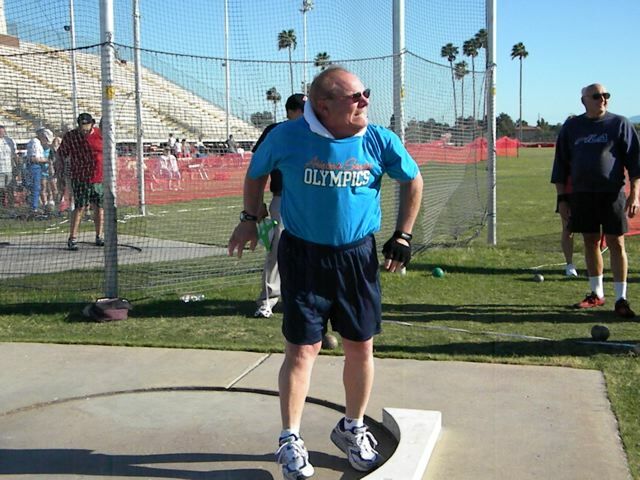 IN THE EARLY NINETIES WHEN I TURNED 50, ST. LOUIS CREATED A SENIOR OLYMPICS, AND I STARTED THROWING THE SHOT COMPETITIVELY, AND I HAVE JUST KEPT DOING IT. I DO NOT COMPETE AGAINST THE OTHERS, BECAUSE ALL OF THEM ARE SO MUCH BIGGER THAN ME. I JUST COMPETE AGAINST MYSELF. BUT AS THEY DIE, BECOME UNABLE TO COMPETE OR JUST DROP OUT, LIKE THE ENERGIZER BUNNY, I JUST KEEP THROWING… AND BY THE TIME I AM 80, GOD WILLING, I SHOULD BE ABLE TO BE THE ONLY ENTRANT AND GET A GOLD MEDAL. I DO WORK OUT DAILY DOING CARDIOVASCULAR AS A PART OF MY ROUTINE, AND THEN I MIX IN SMALL TO MEDIUM WEIGHTS FOR MUSCLE TONE AND STRENGTH, OF WHICH I HAVE NEITHER. 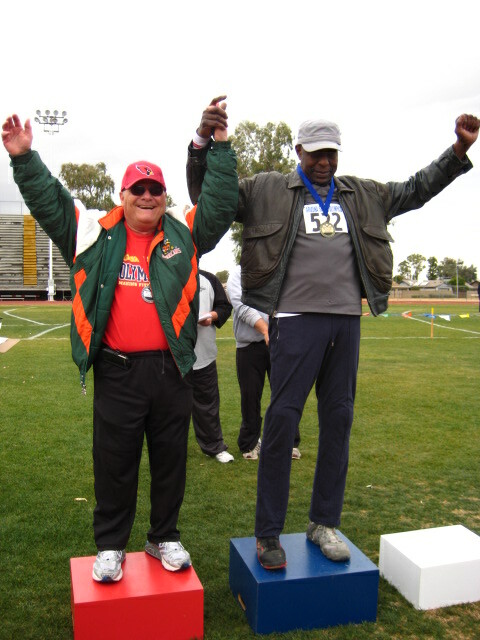 IRA—FINALLY GOT THE PICTURES OF ARIZONA’S SHORTEST SHOT PUTTER WINNING A BRONZE MEDAL AT THE SENIOR OLYMPICS IN FEB 2010. STILL THROWING IN THE 65-69 AGE GROUP UNTIL DECEMBER, AND ONLY 10 YEARS AWAY FROM THAT GOLD MEDAL AT, 80 WHEN I WILL BE THE ONLY COMPETITOR. You can learn more about Marc’s sports background and success by visiting this site. He has been putting the shot since junior high school, and has been winning Senior Olympic medals since 2005. I asked Marc how many competitors are left standing now, and how far he threw that little lead globe? Here is his response. What a fantastic athlete this guy is. There aren’t many like him! AND GOT THE BRONZE OUT OF 13 COMPETITORS IN MY AGE GROUP. AND BECOME THE YOUNGEST IN MY AGE GROUP. I JUST RECEIVED THE SILVER MEDAL. 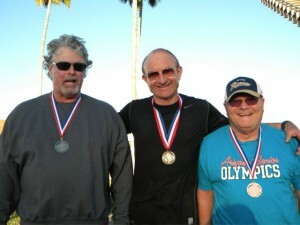 I WAS IN MY AGE GROUP OF 13 SENIORS AND WAS LUCKY ENOUGH TO PLACE SECOND WITH A THROW OF 31′. IRONICALLY THE GOLD MEDAL THROW WAS 31′ 1,” SO I ONLY MISSED THE GOLD BY AN INCH. 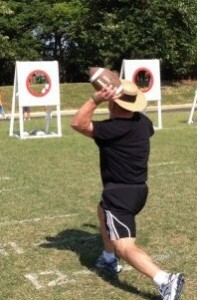 I DON’T THROW COMPETITIVELY AGAIN UNTIL FEBRUARY. 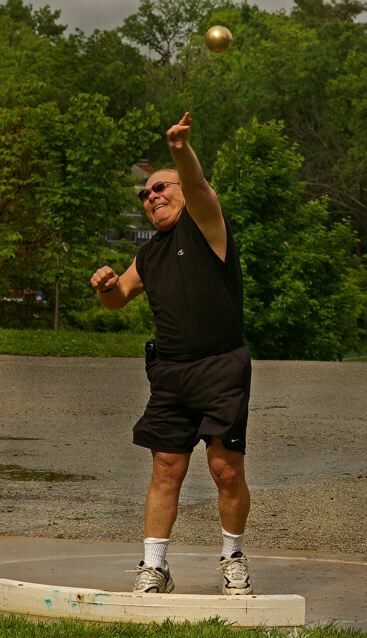 AT 5′6″ AND 160 LBS, I WAS TOLD I WAS TOO SMALL TO THROW THE SHOT…IN THE EARLY NINETIES WHEN I TURNED 50… I STARTED THROWING THE SHOT COMPETITIVELY… AND I HAVE JUST KEPT DOING IT. I DO NOT COMPETE AGAINST THE OTHERS, AS THEY ARE ALL BIGGER THAN ME STILL, BUT AS THEY DIE, BECOME UNABLE TO COMPETE OR JUST DROP OUT, LIKE THE ENERGIZER BUNNY, I JUST KEEP THROWING… AND BY THE TIME I AM 80, GOD WILLING, I SHOULD BE ABLE TO BE THE ONLY ENTRANT AND GET A GOLD MEDAL. 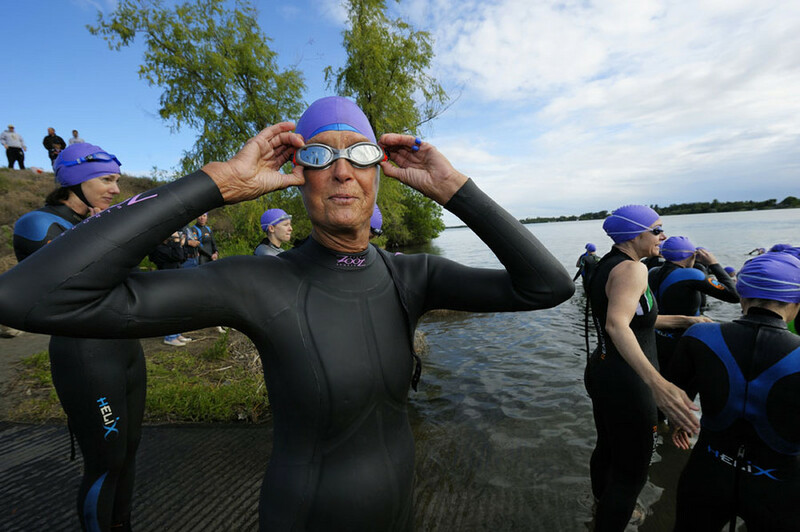 The first portrait is of a Catholic nun who began exercising at 49 and has since finished 20 Ironman triathlons in Hawaii and over 300 more around the world. She is 79! There is a video about her accomplishments at http://www.youtube.com/watch?v=nUp9v8A46dk Check out 66-year-old Clifford Cooper’s October 31st post below about his upcoming Ironman dedicated to his brother who died of Alzheimer’s. Jane Hesselgesser was a concert pianist and Bill Cunningham was a soccer player and a double for Frankie Avalon. Now in their 60’s and 70’s respectively, they compete as a pair in bodybuilding events around the world against couples 20 years younger. Growing old might be a contact sport, but it shouldn’t be a competition you need to lose. That is the premise of The Wonder Years: Portraits of Athletes Who Never Slow Down, a book by Pulitzer Prize-winning photographer Rick Rickman. The official photographer of the Senior Olympic Games, Rickman has profiled everyday athletes who many think were past their expiration date as competitors. From surfers to runners to swimmers to body builders. When a high school student asked the photographer if he had any remorse taking pictures of people doing activities “that might hurt them,” a book idea was born. “I was so taken back I didn’t know how to answer at first,” he said. “I realized that there is this strange perception about aging in this country. I think in the process of growing old and gathering days under your belt, you can decide for yourself whether to be active and engaged and vital all the way to the end. I STARTED THROWING THE SHOT PUT AT NAUTILUS JR HIGH (MIAMI BEACH, FLORIDA), BUT IN HIGH SCHOOL AT 5’6″ AND 160 LBS, I WAS TOLD I WAS TOO SMALL TO THROW THE SHOT. I HAVE STAYED INVOLVED IN SPORTS AND FITNESS THROUGHOUT MY LIFE. IN MY THIRTIES I PLAYED IN AN UNDER-SIX-FOOT BASKETBALL LEAGUE UNTIL I WAS 40 AND ALSO PLAYED QUARTERBACK IN A MEN’S FLAG FOOTBALL LEAGUE UNTIL I WAS 36. ALL THE WHILE FOR RECREATION I HAVE GONE IN THE BACKYARD AND THROWN THE SHOT PUT JUST FOR FUN AND THE CHALLENGE OF SEEING HOW FAR I COULD THROW IT. 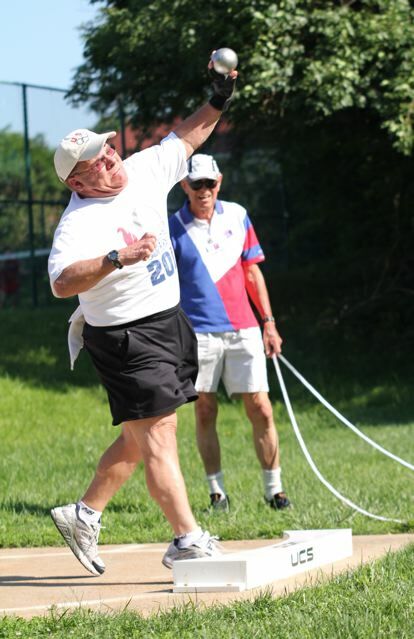 IN THE EARLY NINETIES WHEN I TURNED 50, ST. LOUIS CREATED A SENIOR OLYMPICS (NOT SURE WHAT YEAR), AND I STARTED THROWING THE SHOT COMPETITIVELY ALONG WITH THE OTHER EVENTS, AND I HAVE JUST KEPT DOING IT. I DO NOT COMPETE AGAINST THE OTHERS, AS THEY ARE ALL BIGGER THAN ME STILL, BUT AS THEY DIE, BECOME UNABLE TO COMPETE OR JUST DROP OUT, LIKE THE ENERGIZER BUNNY, I JUST KEEP THROWING… AND BY THE TIME I AM 80 GOD WILLING, I SHOULD BE ABLE TO BE THE ONLY ENTRANT AND GET A GOLD MEDAL. I DO WORK OUT DAILY DOING CARDIOVASCULAR AS A PART OF MY ROUTINE, AND THEN I MIX IN SMALL TO MEDIUM WEIGHTS FOR MUSCLE TONE AND STRENGTH OF WHICH I HAVE NEITHER. 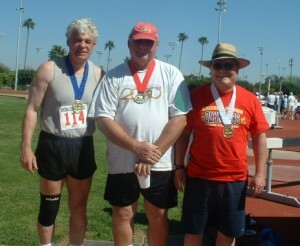 I HAVE ATTACHED SOME PICTURES FR0M BOTH THE ARIZONA AND ST. LOUIS SENIOR OLYMPICS. IN BOTH OF THESE I WAS LUCKY ENOUGH TO SCORE BRONZE MEDALS WITH THROWS FOR 30-32′ TAKE CARE AND THANKS FOR YOUR INTEREST. 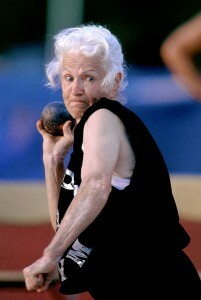 You are currently browsing the archives for the shot put category.